During my recent visit to Michigan's Upper Peninsula, I repeatedly asked myself, "Why did it take you so long to come back here?" and "Why don't more people visit this place?" I try to live my life without regret, but I found myself regretting my failure to visit the U.P. since the last time I visited as a boy. I suppose I thought that I eventually would visit because the U.P. would always be there. Fortunately, it was there, and it was better than I remembered. And I will be returning as soon as I possibly can. My family and I stayed in only two places in the U.P. Our first two nights were in Grand Marais, a small but beautiful coastal town on the eastern end of the Pictured Rocks National Lakeshore. The only way to reach Grand Marais and the U.P. from the Lower Peninsula by car is across the majestic Mackinac Bridge. 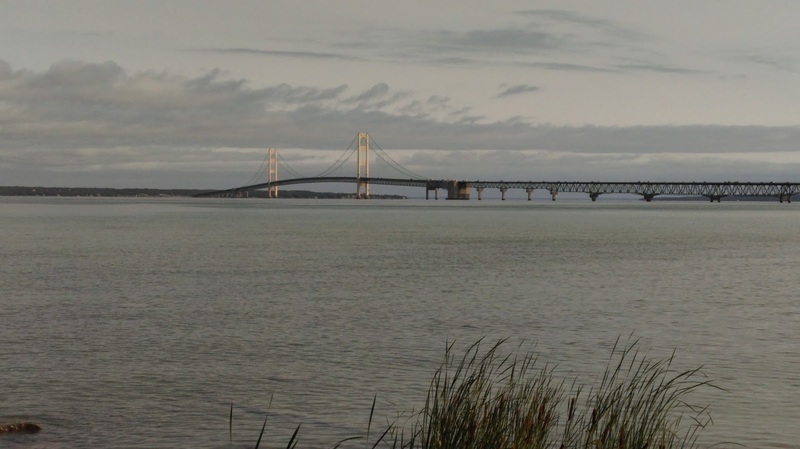 Crossing the Mighty Mac was always one of my favorite parts of my childhood U.P. trips, but I did not remember how breathtaking the view from the bridge was. We were surrounded by beautiful blue water spotted with green, tree-covered islands as we soared 200 feet above the straits. I turned to my wife and said, "I keep telling myself, 'This is so beautiful!' over and over again." As a kid, I was more impressed by the bridge. Now, I still appreciated the bridge, but I was most impressed by the view of the straits the bridge provides. After crossing the bridge, we headed west along US-2 instead of heading east, as my family always did. 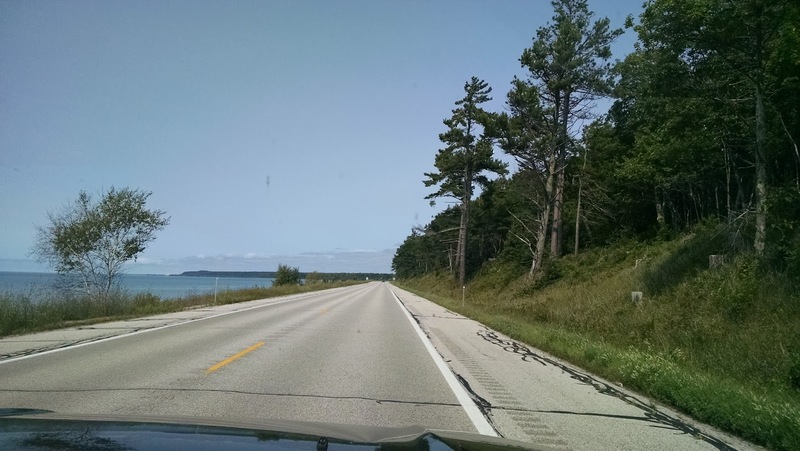 The highway runs along the Lake Michigan coast and provides gorgeous views of Lake Michigan. We stopped at a couple of scenic overlooks and marveled at the tremendous body of water before us. 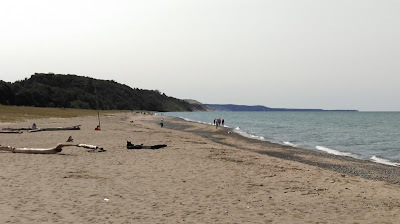 We thought of stopping to swim, but I had the opportunity on the way back from Grand Marais toward Lake Huron to take a dip in Lake Michigan from a rest area on US-2 (so I could swim in all of the U.P. 's Great Lakes during our trip). We eventually turned inland and headed north along M-77, which took us over rolling hills through forests and farmland. 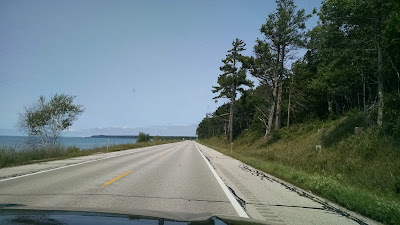 As we approached Grand Marais, we reached the crest of large hill and saw miles of blue water ahead of us. Lake Superior! From that crest, we made our way down the final hill of M-77 to Grand Marais. It did not take long to recognize that Grand Marais and its surroundings are one of the most beautiful places I have been. The Lake Superior beach seems like a mix of Pacific Coast, New England Coast, and North Carolina's Outer Banks. The Pacific feel came from the seemingly endless expanse of blue water in front of us and the giant sand dunes on the western end of the beach. To call them dunes is an understatement, though, because they look more like enormous sand cliffs. On the eastern end of the beach, the dunes are smaller, with grass growing from them. The houses peeking out from behind the dunes are reminiscent of the beautiful dune-lined beaches of the Outer Banks. The New Englandness of the beach is found in the stones covering the sandy shoreline, instead of shells, and the seawall and small harbor at the eastern end of the beach. 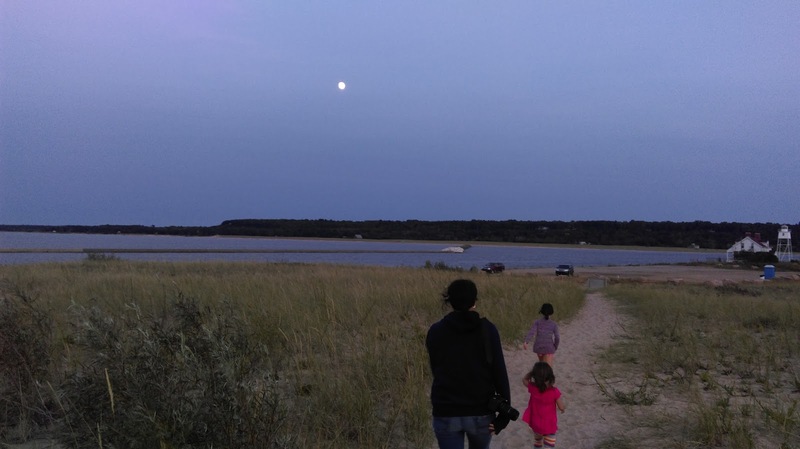 My family spent much of our two days in the area on Grand Marais's beach. The water was cold, but not cold enough to keep me from taking three quick (okay, very quick) swims in Lake Superior. Dogs have to be on a leash, but our dog swam out pretty far on her retractable leash to chase the driftwood we threw for her. I found that the easiest way to make the cool and windy Upper Peninsula air feel tropical was to dive into Lake Superior. 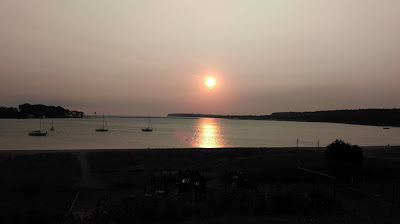 The sunsets and sunrises over the beach and town are stunning. One night, I turned around after the sun set over Lake Superior to see a beautiful white moon shining above the sand dunes. With only a few stores and restaurants, Grand Marais does not have much to offer in terms of shopping or dining options, but the limited options it has are quite good. On our first night in town, we ate at the Lake Superior Brewing Company. The restaurant is small and was crowded, so we had to eat outside. The beers were good, and the food was a pleasant surprise. My Lake Superior whitefish basket was delicious, but the highlight was my wife's whitefish tacos. I would never have guessed that a small-town brewery on Lake Superior would be the home to one of the best Mexican dishes we've had since moving back to Michigan. 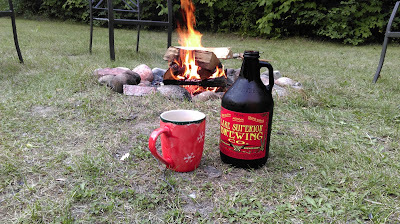 I also added to my growing Michigan brewery growler collection with a growler of their stout. U.P. beer and a bonfire. We meant to try the Breakwall Bakery & Cafe for breakfast or dinner, but time got away from us, which happened frequently in the U.P., so we ended up getting only coffee and pastries on two mornings. The cinnamon rolls were excellent. Grand Marais also offers a couple of hardware stores, a grocery store, a gas station/grocery, an outdoor outfitter, and a couple of other restaurants. It has everything you need after a day at the beach or exploring the Pictured Rocks. It also has some historic buildings, like the Pickle Barrel House Museum, an old post office, and a life saving station that add to the town's rustic feel. We rented a small house in the woods, just outside of town near the crest of the hill where we first saw Lake Superior. From the road, we could see the lake down below. We had small bonfires in the property's fire pit and ate s'mores and fire-cooked hot dogs. The stars on the first night were incredibly bright and only enhanced the peacefulness of the Upper Peninsula night. "Grand Marais" might mean "big marsh" in French, but if I had one word to describe it, it would be idyllic. 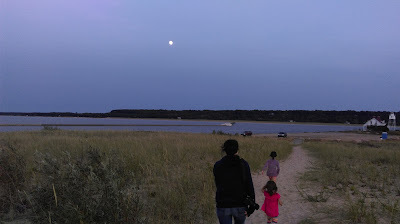 Whether I was watching our daughters and dog play on the beach, walking through nearby forests, swimming in Lake Superior, or gazing at the stars, I could just live in the moment. No chasing money, status, or dreams. No worrying about hurrying to make it to dinner in time. Just enjoying the tranquility of my surroundings.